Thank you for making the day. Loved the diversity of the music, all excellently played. 'Amazing', 'very professional' were just some of the phrases from our guests. And as for learning Pretty woman especially for the day, I was shocked, I couldn't believe how well you made it sound. Also, like to commend your appearance and punctuality. I would highly recommend you to anyone. The Mercian Strong Quartet played at our annual alumni reunions on campus on Saturday 8th June; all played wonderfully and appreciatively received. One alumna commented on her way out of the concert hall that the performance had been the highlight of her day. All four members of the quartet were professional, polite and punctual. I would not hesitate to book them for another future event. The Mercian String Quartet is not only composed of fine young musicians -- able and versatile instrumentalists, and true professionals -- but also fine young people, who were punctual, polite, always smiling, and always happy to be taking part in someone else's Big Occasion. 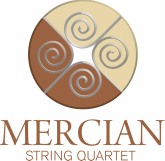 All in all, the Mercian String Quartet was wonderful, and wonderfully priced, a steal, actually. As soon as I contacted Chloe she put my mind at rest! Chloe came up with all of the ideas and did all of the planning. The music played was perfect and was exactly what we had spoken about. The duo were very professional at each stage and I would highly recommend them! The Mercian String Quartet really brought our event to life. A mixture of contemporary and classical pieces, the quartet certainly had something for everyone. Highly recommended. Thank you so much for organising what was a beautiful addition to the day. The music choice was fantastic and you played all of it so perfectly. Everyone was commenting on how good you were, and your group kept our guests very well entertained. You were worth every penny and made a very classy addition to our special day affordable for us. There were so many comments from people at the wedding that thought your performance added a special edge to the wedding that they were not expecting and made it really special. Thank you for this. Chloe helped us pick out festive carols that would be easy for everyone to sing along to. The group is highly organised, punctual and very reliable… with so many things to plan for the event, I knew this was one thing I didn’t have to worry about. The quartet did a perfect job in bringing some festive cheer and music magic into our school. I would highly recommend them and we will definitely be booking them for future events.